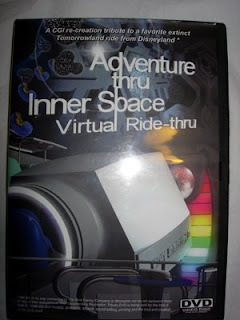 This is the "Adventure Thru Inner Space Virtual Ride Thru DVD", which depicts the former ride at Disneyland's Tomorrowland. This ride, which was called "Adventure Thru Inner Space", was sponsored by Monsanto. This DVD is a re-creation of the former attraction at Disneyland- and is animated in great detail. The DVD even walks you through the queue where guests walked. I remember this ride very well- I used to call it the "Snowflake Ride" because you get into a vehicle called an "atom mobile" and you watch as you shrink down to the size of a snowflake- and then you continue to get smaller and smaller. Eventually you get down to the size of atoms- and you can see water- H20- as you have never seen it before. Eventually you get even smaller than an atom- so much so, that you can see the nucleus of the oxygen atom. This was a fun ride, very stylized, and educational. It also seemed real- especially to kids, who have great imaginations! After running for years, this attraction, which, in my opinion, was never outdated but was also never maintained, was removed to make way for "Star Tours". This DVD is really amazing, and it's worth checking out. It was not made by Disney; however, I'm sure that Disney knows about this DVD, and I'm sure that it contributed to the idea that Disney has now embraced: to make virtual ride-thrus of their current and former attractions- as evidenced by the newly released DVD versions of "Sleeping Beauty" and "Tim Burton's The Nightmare Before Christmas". To see more about the DVD featured here, please check out atommobiles.com.